This bushy evergreen shrub certainly earns its place in the garden. 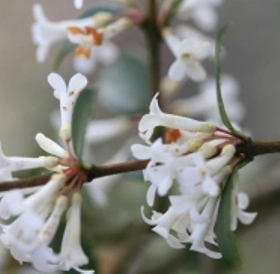 Its glossy dark green leaves provide a year-round backdrop for seasonal plantings, but it is in spring that it comes into its own, when it is covered with many highly-scented, tubular white flowers that are much loved by early foraging bees and insects. The geographical range for this species is southern China (Yunnan province), where it grows at high altitude on chalky soils. It is the parent of several garden hybrids, but has the Royal Horticultural Society’s Award of Garden Merit in its own right as an easy and tough evergreen plant which can be grown on any soil type. Here it flowers profusely on an acid sandy soil.